1. 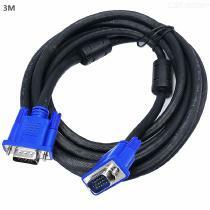 Product name: 3+6 VGA video line. 2. Material: copper wire + aluminum foil +PVC, with double true magnetic ring. 3. Interface: 15PIN VGA/company to company. 4. Support all VGA devices, such as: display, LCD HDTV, projector, DVD, etc.